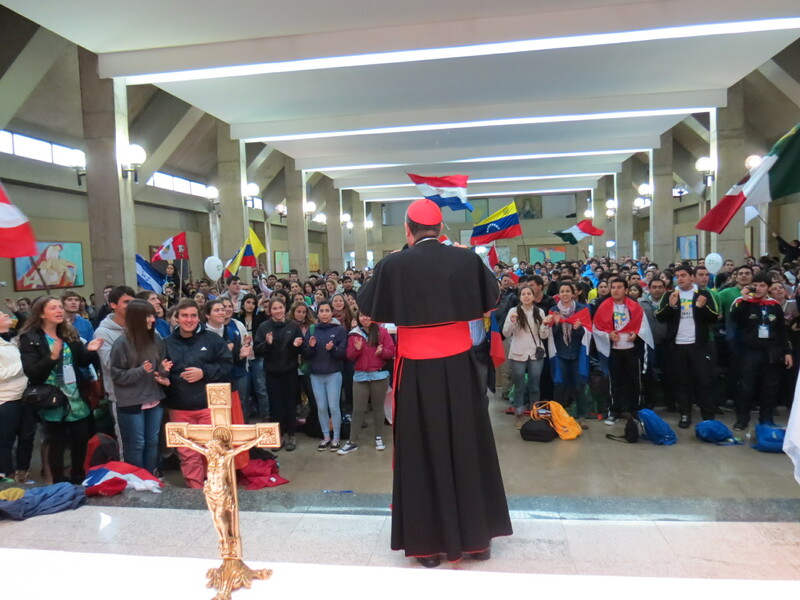 Not even the rain could dampen the spirits of the hundreds of World Youth Day pilgrims who went to the church of Santo Aghostino on the outskirts if Rio de Janeiro to hear the catechesis of Caritas president, Cardinal Oscar Rodriguez Maradiaga this morning. The church was packed full of young people from all corners of Latin America. Cardinal Rodriguez name-checked all of the groups according to the flags they were waving giving rise to cheers: Colombia, Argentina, Honduras, Belize, Peru… and many more. Speaking in his native Spanish, Cardinal Rodriguez said how despite all the technology we have, people still find themselves disorientated. He said we need to listen more to the word of God and cited one of Pope Benedict’s first tweets in which he advised us to talk to Jesus through prayer, listen to his words and meet with him through the poor. Cardinal Rodriguez emphasised the necessity of practicing faith and said that people who say they’re Catholic but non-practicing are no Catholic at all. He told the young pilgrims that they could practice their faith with Caritas. Mentioning Caritas’s upcoming anti-poverty campaign on the right to food, the Cardinal said the pilgrims could start to get informed and look at how much food restaurants and shops waste in their own country. He invited the young to be volunteers for Caritas. He said how following Peru’s 2007 earthquake, many young people worked tirelessly for hours on end to dig out those trapped. “Many people have dry spiritual lives,” said the Cardinal. Young people should have a veritable garden for their spiritual life. “Are you in good spiritual health?” he asked. Meanwhile, Pope Francis visited a favela this morning. I saw favelas as I was travelling out to Santo Aghostino. They looked so precarious perched on the hillsides. Even though Rio is considered an exotic holiday location in Western culture, the poverty is desperate and visible in many places you go. At the favela of Varginha, Pope Francis said, “No one can remain indifferent to the inequalities that still exist in the world. Let each according to their capacities and responsibilities, offer their contribution to end many social injustices. Up to one million pilgrims went to Mass celebrated by Pope Francis on Copacabana beach this evening. The rain even stopped for the occasion. As I wrestle with my jet lag (“Wake up! It’s not really 3am, but 10pm), I start making my plans for tomorrow. Cardinal Rodriguez is doing his final catechesis in the Paróquia São Rafael in Vista Alegre. Caritas Brazil is taking part in a three kilometre march from Arpoador to Copacabana beach between 1.30pm and 3pm. And pilgrims will join Pope Francis for the Way of the Cross on Copacabana at 6pm. I think I’d better get some sleep….